Exactly one week ago, Cristiane “Cyborg” Santos’ (Pictured) manager, Tito Oritz, requested his client’s release from the UFC. Fast forward just seven days and not only was Ortiz and Co. granted their wish, but Cyborg has already found a new home and has been issued her first assignment. 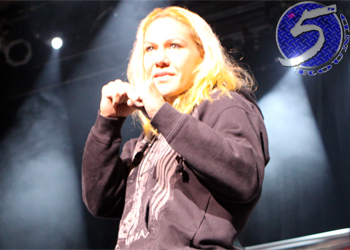 The former Strikeforce featherweight champ has inked a multi-fight deal to join Invicta FC. Cyborg makes her promotional debut April 5th against Ediene Gomes inside Ameristar Casino Hotel Kansas City, Missouri. Invicta President Shannon Knapp confirmed the winner of the scrap will face Marloes Coenen to become the company’s inaugural 145-pound champ. Although the all-women’s mixed martial arts promotion has plenty of stars under their banner, Cyborg is by far their biggest. Cyborg hasn’t been seen since her December 2011 TKO victory against Hiroko Yamanaka was overturned to a no contest. The Brazilian was busted for steroids shortly after the bout and was issued a 12-month suspension. The 27-year-old had the opportunity to join the UFC and arrange the most anticipated female fight in MMA history against bantamweight champion Ronda Rousey, but Cyborg claimed it was physically “impossible” for her to shed the extra 10 pounds required to compete in the only women’s division offered in the Octagon. Cyborg owns a 10-1 (1 NC) professional record and was unanimously considered the baddest woman in bare feet before her drug ban.